Hi guys, billion of users daily work on his Desktop PC, laptop or tablet. At present time most of the person works on windows operating system. Some person always want to keep clean of his desktop area. For this they remove all the shortcuts and files from his desktop area. If someone working on the windows 7 operating system and want to know how to place Recycle bin in Windows 7 Taskbar. Then most of the person will give a single answer drag the recycle bin icon and drop it in windows 7 taskbar. But if you do this job then you will get that it will appear and pinned under windows explorer. Which is not provide full functionality, you must have to click more than one time to open it. So, today we have to discuss guide to place Recycle bin in Windows 7 Taskbar. All we know very well about the recycle bin. Recycle bin is generally used to keep all deleted files, folders, shortcuts. You can easily recover them until they exist in recycle bin. If you purge all items from recycle bin then you will not be able to recover them. You can also use SHIFT+DEL key to permanent delete files or folders without sending them in recycle bin. You can also choose “Don’t move files to the Recycle Bin. Remove files immediately when deleted” option in Recycle Bin properties box. You will be able to easily place Recycle bin in Windows 7 Taskbar. This guide will helps you to place Recycle bin in Windows 7 Taskbar in full functionality. For this you must have to turn on Quick Launch bar. Step 1: You must have to set Quick Launch toolbar. For this press right mouse button on the windows 7 taskbar. Step 3: Click Select Folder button. Now, you will see a Quick Launch toolbar in Windows 7 taskbar. If you want to see only icons in the Quick Launch toolbar then press right mouse button and unchecked Show text and Show title. Step 4: If you want to enlarge icons in the Quick Launch toolbar, press right mouse button > Click on View > Choose Large Icons. Step 5: Now, drag Recycle Bin icon and drop it on Quick Launch toolbar. Now, Recycle Bin shortcuts will be placed in the Quick Launch toolbar. Note: After place Recycle bin in Windows 7 Taskbar. You can also remove desktop icons like Computer, Recycle Bin, User’s Files, Control Panel and Network. For this press right mouse button on desktop area > choose Personalize > Click on the Change desktop icon > Uncheck required icons from desktop. If you want to remove Quick Launch toolbar then press right mouse button on Quick Launch toolbar > Click on the Toolbars > Uncheck Quick Launch. I hope you like this article. After reading the article Guide to place Recycle bin in Windows 7 Taskbar your problem will be solved. 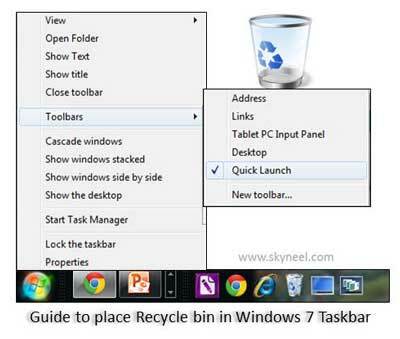 Kindly share this guide to place Recycle bin in Windows 7 Taskbar with your friends, family members and others. Thanks to all.